The only restriction is months July - December are locked out so you can't enter the last half of the year unless you purchase the actual "Farm Biz " Program. An incredible value at $249. After completing this form you will be taken to the download area with instructions for Downloading the Farm Biz Program or recieve information on placing an order for the actual CD =$15.00 Shipping Charge. Computer Solutions for over 25 years. "Easy as Quicken . . . but better 'cause it's made for farmers and ranchers." The Evaluation Demo program is the complete "Farm Biz" Entry level Accounting program. Absolutely No Setup Required. Just install and enter your records. Use this program as long as you like. When you get acquainted with the way it operates, we hope you will become a customer. The complete demo program is 24 meg. On a 56K modem this can take over to 2 hours to download "Farm Biz" freeware. You need to have 70 meg free to install & operate "Farm Biz" on your computer. A free Farm Biz Demo CD is available . Shipping & handling charges are $15. Checkbook balance on the screen as you key income & expense transactions. 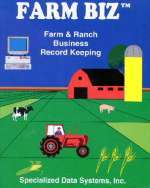 Chart of accounts already set up for farming & ranching. Just click on the one you want. Two quantities on every transaction for pounds, bushel, head, etc. plus the $ amount. The last date used is input for you. Click on the spinner or press "Plus/Minus" to change the date. Each new check number increments by 1 from your last check number. Use vendors (payees with names & address) when you want. It's optional. View and sort all your transactions by check #, date, vendor, or dollar amount. Reconcile your entries to your bank statement by clicking on those that are cleared. Customize the Standard Farm chart of accounts so you only see favorites for your farm. Back up your data to removable media under program control.. Restore your vital data from removable media under program control. Keep & access multiple farms for multiple years. Create a Cashflow plan. Prepare a Networth Statement. Close the year and roll over balances to the next year. Print checks with one click (Optional). Other Business P&L for Custom Trucking, Roadside Stand, etc. Tax Schedule F worksheet with projections to year end. Transaction Report by Item. Complete year or with Selections on Enterprise, Vendor, dates, etc. Trial Balance prints all detail for a month in deposit and check order. The reports that are underlined can be viewed in your browser by clicking on the report title.